L to R: Urban Stages Artistic Director Frances Hill , Helen Coxe, Playwright Zhu Yi, Pun Bandhu, Wei Yi Lin, Seth Moore, Alan Ariano, Projections Designer Ryan Belock, and Lydia Gaston. L to R: Lydia Gaston, Pun Bandhu, Wei Yi Lin, Alan Ariano, Seth Moore, and Helen Coxe. L to R: Lydia Gaston, Pun Bandhu, Wei Yi Lin, Playwright Zhu Yi, Director John Giampietro, Alan Ariano, Seth Moore, and Helen Coxe. Lydia played as "Mrs. Li" in Urban Stages' Off-Broadway run of celebrated Chinese playwright Zhu Yi (Member, Ensemble Studio Theatre's Youngblood) from Wednesday, November 15, 2017 through Sunday, December 10, 2017, directed by John Giampietro, and starred Alan Ariano, Pun Bandhu, Helen Coxe, Lydia Gaston, Wei Yi Lin, and Seth Moore. Rebecca Kane (Stage Manager), Jeana Caporelli (Assistant Stage Manager), Frank Oliva (Set Designer), John Salutz (Lighting and Sound Designer), Audrey Nauman (Costume Designer), Ryan Belock (Video Designer) and Kim Sharp (Technical Director). 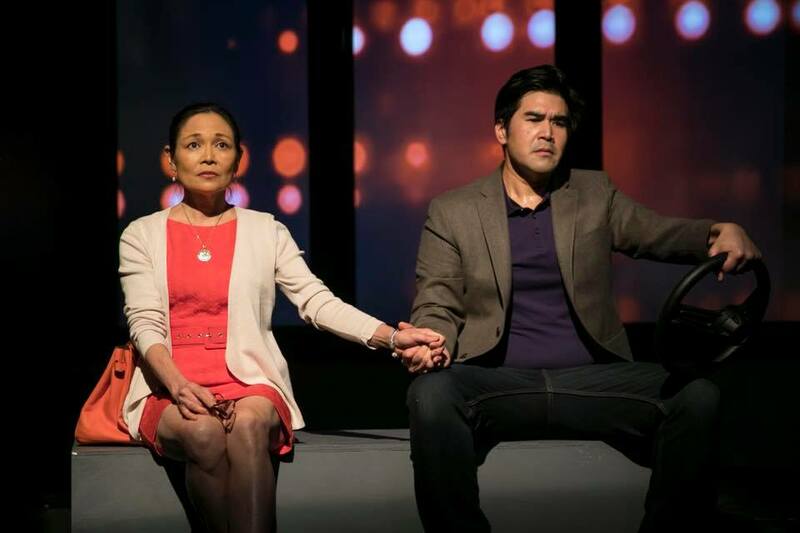 L to R: Lydia Gaston and Alan Ariano as Mr. and Mrs. Li. "Mrs. Li, the mother, whose deep anguish we feel only toward the end, is gently played by Lydia Gaston." "A Deal is an exploration of a young woman’s simple dream to “make it” away from home. Directed by John Giampietro, A Deal feels like a series of scenes from a film. From beginning to end, you watch as Wei-Yi Lin’s Su tussle between her love for her family, (Alan Ariano as the hilarious, but easy to anger Mr. Li and Lydia Gaston as the noble, pensive Mrs. Li), and her dream to become the first Asian American, Oscar-winning lead actress." Like many new upper-middle-class Chinese families, Mr. and Mrs. Li are proud to give their only daughter a life they could only dream of (an Ivy League degree in art and an apartment in Manhattan), until they realize she’s turning into a dangerous stranger. A DEAL is a dark comedy that features a Chinese family’s home buying journey in New York in winter 2015, a time of increased real estate property ownership by overseas Chinese and a sharp decline in the value of the Chinese yuan against the US dollar. It reveals the ideological conflicts between the East and the West in contemporary society by tracking a little stream of the global cash flow. This was the first Off-Broadway production for international known playwright Zhu Yi and A DEAL. The play simultaneously toured China in Mandarin. John Giampietro (Director) is a Brooklyn based stage director of Opera and Theatre. Recent credits include La Feldeltà Premiata at The Juilliard School, The Turn of the Screw and Carousel at Chautauqua Institution Festival of Music. He is a frequent director with Youngblood, Ensemble Studio Theater’s Obie-award-winning young writers group. At EST John directed the NY Times acclaimed production of Year of the Rooster by Olivia Dufault. Other opera and theatre productions seen at Actors Theatre of Louisville, Vermont Shakespeare Festival, Curtis Institute of Music, The Flea Theatre, and NYU Tisch School of the Arts. He has directed over 20 operas for the Chautauqua School of Music where he is the principal stage director. John is a faculty member in the Vocal Arts department at The Juilliard School. Writing includes new English dialogue versions of Mozart’s Die Zauberflöte and Der Schauspieldirektor. Upcoming, a new English dialogue version of Nicolai’s opera The Merry Wives of Windsor for The Juilliard School, in 2018. Originally from the Philippines, Lydia is an actor, singer, dancer, and teaching artist. She is a veteran of five Broadway shows, a former dancer for Ballet Philippines, and a graduate of the M.A. in Applied Theatre from The School of Professional Studies, CUNY Graduate Center. Click here to learn more about Lydia.